Wigwam's Ironman® Spectrum Pro covers all your bases with moisture controlling drirelease® Tencel®, comfortable Stretch Nylon and insulating Merino Wool. Featuring front and back cuff tabs, in-step mesh for ventilation and virtually seamless toe closure. Experience the all new Balega Silver with a supercharged fit, encapsulating compressive midfoot arch and antimicrobial silver layer. Step up to the next level in sock performance and give your feet the protection they deserve. Balega provides harmony in the fit, feel and performance thanks to its superior technical design and durability. A pro-look combined with packed-up technologies is what IRONMAN® triathletes will look for in their socks! Socks that breathe, protect sensitive points and activate blood circulation, you do not ask for less. Ditch the boring running socks and bring some color to your runs. Comfortable and cool, and clearly Canadian! Single layer of Dri-Wright polyester and nylon, with a highly breathable mesh panel to keep your feet cool. Quarter height. 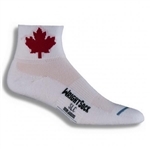 This is the most breathable lightweight Double Layer Wrightsock and is designed for a minimal feel. Ideal for running, walking, light hiking. Great travel sock that dries quickly and is ready for use the next morning. Sweat and blisters are a thing of the past when you're sporting Wigwam's Ironman High Voltage Pro. Featuring Ultimax Pro enhanced with Dri-release® Tencel, these socks will keep your feet dry, blister-free and odorless. Features a cushioned sole. The Compressport Cycling Compression Socks V2 feature a seamless finish, ultra-ventilation mesh zones, improved arch support and blood circulation. Featuring Ultimax Pro which promotes dry feet, no blisters, no odor, Foot hugging fit X2O Acrylic contains Chitosan a natural odor defense, Ultralight, Breathable mesh instep, Seamless to closure. Constructed with an advanced blend of CoolMax, cotton and Lycra fibers, these athletic socks keep feet feeling cool and dry from start to finish, so you can train even in the hottest temperatures. CEPs new dynamic foot technology delivers targeted compression in the ankle and mid-foot. Targeted 22 mmHg compression at the ankle improves venous return and can be worn with the Progressive Calf Sleeve. Featuring Ultimax Pro, these socks will keep your feet dry, blister-free and odorless. Features a cushioned sole. Featuring Ultimax Pro, these socks will keep your feet dry, blister-free and odorless. Ultralight, Breathable mesh air vents. Seamless toe closure. Made with moisture wicking CoolMax. Mesh top allows faster transfer of heat. Nylon is added for strength. Lycra assures a comfortable fit. Made in the USA.